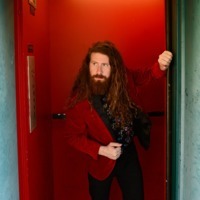 Casey Abrams (born February 12, 1991) is an American musician and multi-instrumentalist from Idyllwild, California who finished in sixth place on the tenth season of American Idol. He was eliminated from the competition on April 28, 2011, five weeks after being saved from elimination by the judges. Abrams was born on February 12, 1991 in Austin, Texas, to Pam Pierce and Ira Abrams. He spent his early years in the Chicago area, first in Evanston, Illinois, then in Wilmette, where he attended McKenzie Elementary School. Abrams later moved to California and attended middle school and high school there. He was a student at Idyllwild Arts Academy in Idyllwild, California, where his father teaches film production. At Idyllwild Arts, he studied classical bass instruction and improvisation, and participted in the jazz ensembles, gaining a foundation in music history, piano, and jazz piano, and learning to write musical scores for films. After graduating from Idyllwild in 2009, he attended University of Colorado at Boulder as a music major. He worked as a film camp counselor at Idyllwild Arts Summer Camp prior to his appearance on American Idol. Abrams suffers from ulcerative colitis, an inflammatory disease which causes ulceration and inflammation of the colon, and that occasionally requires blood transfusions, which resulted in his having been hospitalized while on American Idol. Abrams lists as his musical influences Ray Charles, Frank Sinatra, Oscar Peterson, and James Taylor, as well as Marshall Hawkins, head of the jazz department at Idyllwild Arts Academy. Abrams was eliminated from the competition on April 28, 2011, finishing in sixth place. During his last performance he sang "I Put a Spell on You" by Screamin' Jay Hawkins, a song he had performed during the semifinals. During the performance he kissed audience members, rolled onto the stage, thanked the judges, and sang the last two words ("you're mine") to fellow contestant Haley Reinhart. On May 25, 2011, Abrams sang "Fat Bottomed Girls" with Jack Black on the American Idol finale. Abrams appeared and performed on The Tonight Show with Jay Leno in April 2011, and Live with Regis and Kelly and MTV's The Seven in May of the same year. He was one of the performers in the 2011 American Idols Live Tour, which began in West Valley City, Utah in July 2011, and ended in Manila, Philippines in September 2011. In August 2011, Abrams became a spokesman in a national campaign called IBD Icons to raise awareness of inflammatory bowel disease. Abrams is managed by 19 Entertainment. Abrams and former American Idol Season 10 contestant Haley Reinhart recorded a holiday song, "Baby, It's Cold Outside", in November 2011--also released on video. On January 8, 2012 Abrams signed with Concord Music Group. Abrams' linking with Concord Music Group marks the second signing of a contestant from season ten to a non-Universal Music Group-owned label.